Home Unlabelled Article Marketing Robot Review : Is It An Useless Tool? Article Marketing Robot Review : Is It An Useless Tool? Article marketing has been an oldest method of link building most seo's says article marketing doesn't work these days as nobody likes to republish duplicate articles on their website so no one going to use content of an article directory but this might be true but they all miss one point. Even if your submitted articles might not get republished but what about links from article directories itself, these directories has good amount of link juices as well as since your article is relevant with website so they also pass out relevancy that's what i like about these article directories. When it comes to article submission you can go with either two path one that follows manually visiting each and every article directory and registering and after that submitting your content and since there are literally millions of article directories out there things can become much more time consuming. 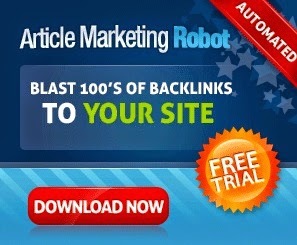 The idea is not to work hard but work smarter with article marketing robot article directories submission can take couple of minutes with this incredible software you can take a break for cup of tea and in that time this software keeps on submitting your content in it's in build list of article directories. After trying several submission tools one thing i have noticed is that article directories often doesn't allows automated sign ups which is a big issues and most of them use some sort of captch to avoid such sign ups you would be glad to know that amr comes with decaptcher feature which solves captcha code automatically so it makes this software unique and unbeatable as compared to the other ones in the market. Note: To avail decapther facility you have to sign up with decaptcher service price is 2$ for 1000 images. Link Reporting: Another feature which i found missing on other submitters was link reporting the problem with article submission is that you have to visit on each article directories to check whether your articles were approved or not so it doesn't makes sense why one should submit articles using a software as at the end you still have to visit thousand of article directories and moreover each one them have different approval time so you have to keep checking each day. But what i liked about amr is that with their live link reporting this software automatically checks your articles status by loging on to article directory sites. Thirdly, it automatically spins your content after each submission so each directories gets unique content so you get good approval rate. Before you get article marketing robot make sure you add fresh article directory list as what i have discovered is that amr is using some outdated list and some of the directories have shut down so you need to add some fresh directories that you can find it anywhere like in blogs, forums just google it.